We work extremely hard throughout Foundation 1 and hope our class page gives you an overview of our exciting and engaging Early Years Foundation Stage Curriculum; as well as all the fun activities we participate in throughout the school year! Exploring Autumn! The children in Foundation 1 visit St Sebastian's Woodland Classroom each Tuesday. This half term we have been exploring the woodlands looking for signs of autumn. PE The children in Foundation 1 take part in a PE session held in the main school hall each Thursday. This term we are developing our yoga skills and enjoying singing and dancing along to action songs. HALLOWEEN!! The children in Foundation 1 enjoyed some spooktacular activities on Halloween. 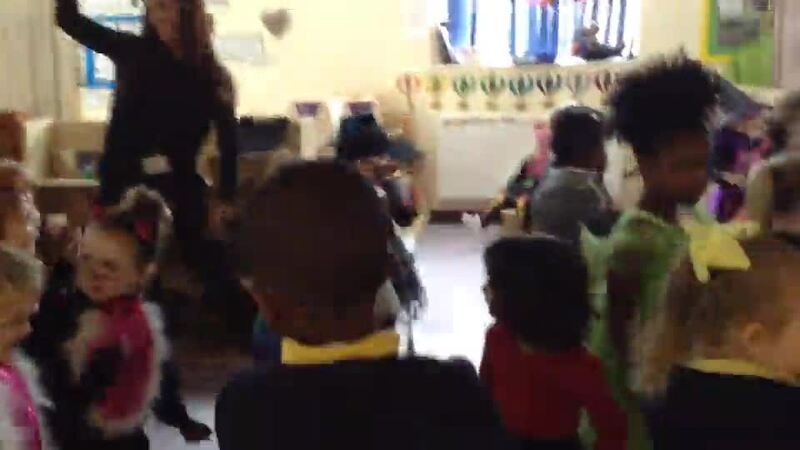 We took part in lots of Halloween themed activities throughout the day and even had a mini Halloween disco! We especially enjoyed learning the ‘Monster Mash’. The children had a fantastic time and all looked terrifying! PE on the Astro Pitch Foundation 1 had so much fun taking part in a PE session with the sports coaches. We enjoyed learning lots of new games, our favourite one was the 'cloud' game. We were able to throw up our clouds and catch them! Christmas Celebrations! Foundation 1 have had a great time preparing for Christmas. We have been so busy practising for our nativity performance, making cards and decorations and having lots of Christmas treats! We wish everyone a very merry Christmas and a happy new year.